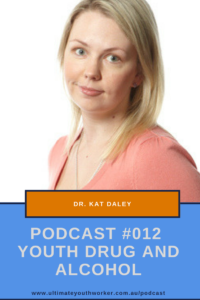 Posted in Alcohol and Other Drugs, Podcast and tagged Drug and alcohol, Research, Youth Work, Youth Worker. Great Podcast. Would love to use this for a university assignment, do you happen to have a transcript of this? Thanks for your feedback. We loved Kat’s openness. Unfortunately, as a small org we don’t have the resources to create a transcript. You can reference the podcast directly though.